Soleseife is German for Brine Soap. For those who are interested, it's pronounced " zo-luh-zigh-feh " I have this pronunciation on good authority from my best friend from Germany, MaryAnn. I'm always interested in my paternal German roots and finding a lovely traditional soap like soleseife just made me do a happy dance! So what's the soapy story behind this bar of soap? Well, the next chapter in the development of this bar was needing a creative way to share my beautiful city with the world. 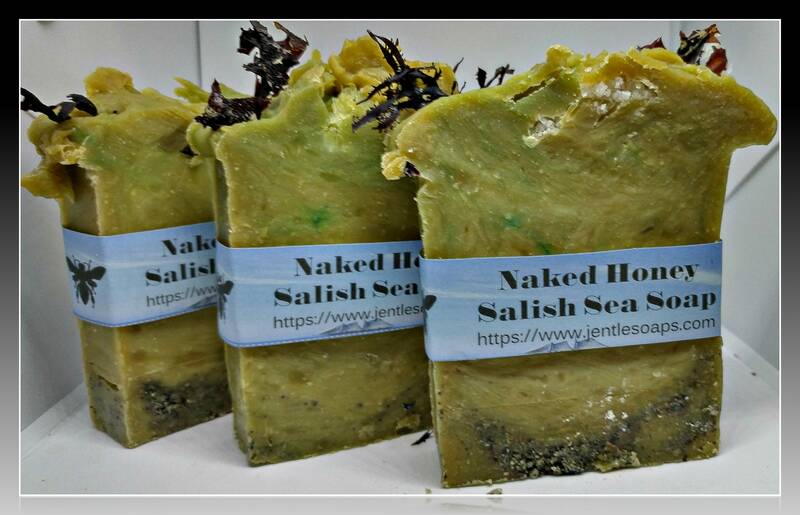 So I foraged in the Salish Sea surrounding Vancouver Island for ingredients, harvested wild blackberry leaves and put my soapy scientific mind to good use! 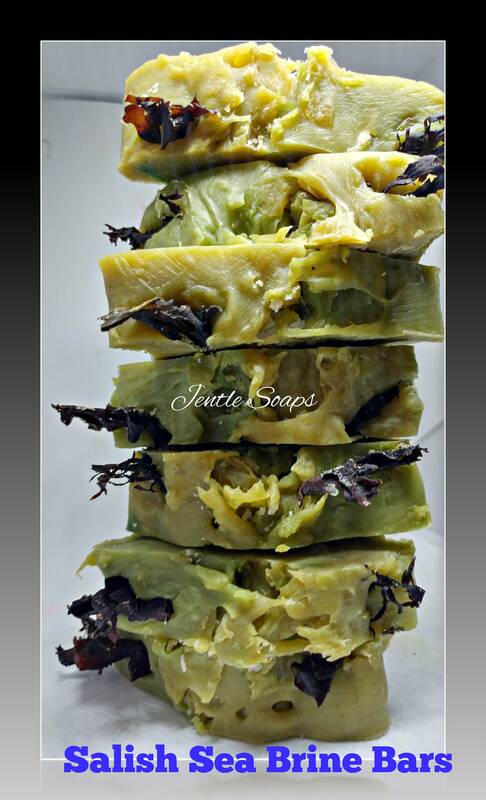 The result is this lovely brine soap that feels slippery to the touch and is packed with nutritious and creamy Water Buffalo Milk Yogurt from a dairy here on Vancouver Island, honey and beeswax from Jentle Apiaries, exotic butters and oils as well as fresh seaweed and blackberry leaves. To make it even more awesome, I put a layer of soap mixed with sand for a nice foot scrub on one end of the bar. You can cut it in half if you get the artisan bar size (only available in my store at www.jentlesoaps.com) as they are quite generous and you'll have two bars, one for the feet and one for the body. This bar also comes in a 100 gram body bar as well as the larger Artisan bar. Keeping this soap stocked on the shelves at the Urban Bee Farm here in Victoria has kept me busy this Summer. Thank you to all of the customers that keep me soaping! 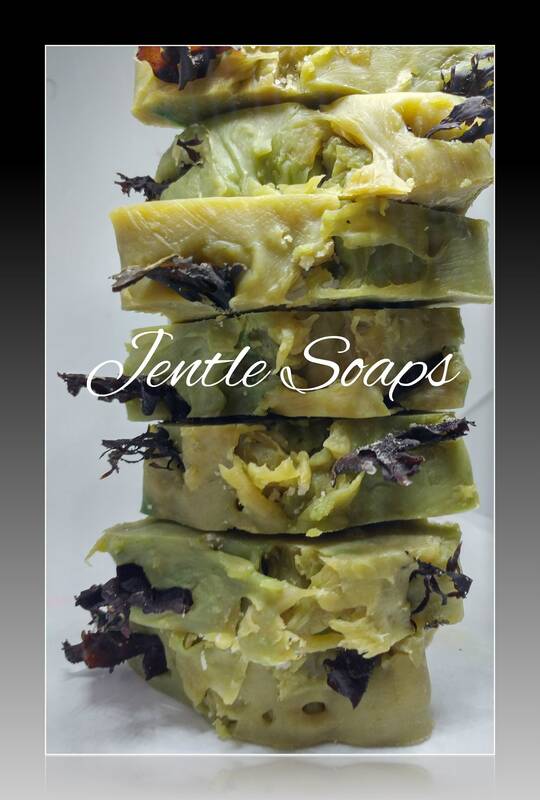 This is an exclusive bar only found at Jentle Soaps and the Urban Bee Farm. If you don't see it available here, just send me a custom order request and we'll set aside a bar for you. We make this one regularly!